A new version of the module NeoRecruit Categories is available ! 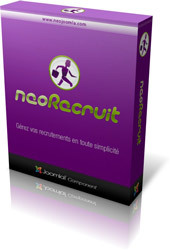 Here it is the new version of the module NeoRecruit Categories, compatible with the latest versions of Joomla! and always available for free download. This module allows to automatically display the tree of the categories created with the component NeoRecruit, without having to create menu items for each category. All the modifications you can do on the categories of the component (add a new category, unpublish a category, etc.) will automatically be reflected in the module, with no extra handling. expand the categories tree in order to make the subcategoriesalways visible. See the module in action on the demo website.